Ever ridden a tuk tuk? If not, it’s an experience to try at least once. 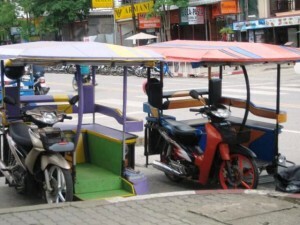 These three-wheeled open-aired taxis are a common way to get around in Thailand. We tried one of these motorized rickshaws after finally arriving in Bangkok after 20+ hours of travel, followed by a few hours of confusion navigating out of the airport to take the railway to our overnight home in Khao San. I made the mistake of getting in one without agreeing to a price so probably got charged double for this error. Being tired and feeling overwhelmed by the traffic, I thought I could negotiate after I got in the vehicle. Unfortunately he started moving forward very quickly, partially perhaps because he was being chased and chastised by an official on the street. I suspected later that it was because the official was trying to keep us from being ripped off. Instead, we took the excuse that the fare was twice as high as the estimate given at the airport because of really bad traffic. So we zipped down many side alleys, dodged bigger vehicles, hung on to ourselves and our luggage, and eventually arrived at our destination. In total we only spent under $7 and were too tired to care by then, but knew better than to give the guy a tip! We later learned that most taxis (the real kind, though in Bangkok often hot pink for some reason) have a meter that helps keep them honest. Within a week we found that tuk tuk drivers often quote one number and then try to charge you for much more after you reach your destination, making it seem as if you misunderstood the charge or acting like you’re trying to cheat him. One driver glared, scowled, and muttered at us in Thai for over 10 minutes before giving up since we weren’t paying him any more than we heard. Riding a tuk tuk can be a risk to the wallet, especially if you’re not a good negotiator or don’t have a good idea of the going rate to your destination. So go for a ride in a tuk tuk, but don’t be taken for a ride by a tuk tuk.